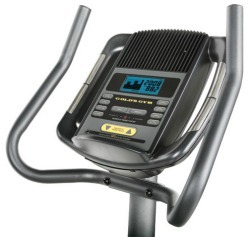 While the ProForm 280 CSX exercise bike is an attractive model that leaves off the frills, except for an iPod player plug-in and a console fan, it won’t make our Best Buy lists when it’s compared with other brands around the same price. The blue-tinted LCD display gives you readouts for time, speed, distance, calories, and pulse, as well as a Target Pacer indicator light to alert you to speed up or slow down to stay in the training zone. The console operates on D batteries. UPDATE: The ProForm 280 CSX has been discontinued and is no longer being sold. 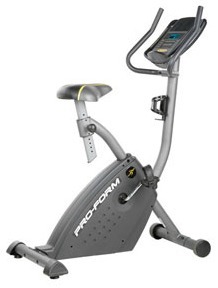 You can check out the latest exercise bike lineup at the official ProForm site to compare the new models. The ProForm 280 CSX exercise bike features SMR™ Silent Magnetic Resistance with 12 levels of tension for varying your workouts. It has a manual setting or you can try the 8 pre-programmed workouts, and it has contact-grip heart rate sensors on the handlebars. The entertainment features include a plug-in port for an MP3/iPod player, a volume control knob, and two 2-inch speakers. The user reviews are average to above average on this bike. Among the pros mentioned is that it is easy to assemble and pedals smoothly. On the downside, the bike seat is uncomfortable, the speaker system is not great, and the fan must be kept “Off” to keep the console batteries from running down too quickly. The display is backlit but it is small and hard to read. The parts and labor warranty is just 90 days, which is too short for a $399 MSPR bike. The ProForm 280 CSX exercise bike has a nice profile design with effective levels of digital resistance and an easily adjustable seat. The frame design is more comfortable than a traditional upright design, but again, seats on ProForm bikes tend to be very uncomfortable. Another observation: this 83-lb frame is rated for users weighing up to 250 pounds; however, we would not recommend it for anyone over 175 pounds. The ProForm 280 CSX sounds like a good deal if you can get it for under $250 (only at amazon), but for the same price you can find better built indoor bikes with heftier flywheels and longer warranties made by Schwinn.